There’s no need to sacrifice taste or nutrition when eating seasonally in New Mexico; fall and winter months provide many tasty vegetables and fruits that store well. Squash is one of the delicious players, and this fall burrito bowl is no exception. This dish comes together easily, economically, and quickly, and gets bonus points for being a fantastic leftover! Winter squash is a flavorful, healthy addition to burrito bowls. You may be asking yourself what kind of squash to use. It can be confusing with so many varieties found at farmers’ markets and stores, but you’ll definitely want to focus on one of the winter squashes. We chose a red kuri squash for this dish, which is a delicious heirloom variety frequently grown by local farmers (heirloom vegetables are old varieties handed down through generations that taste better and are more nutritious than more modern varieties). If you can’t find red kuri, you can also use hubbard, delicata, or butternut squash. You can even use pumpkin! (The small pie or sugar pumpkins will have a better flavor than carving pumpkins.) It’s also good to note that the skins of thin-skinned squash are edible after roasting, so there’s no need to skin them: simply wash, chop, and roast. Winter squashes such as red kuri, hubbard, delicate, or butternut are good choices for this dish. Note: Each ingredient is given in a “per serving” quantity, so you can make as little or as much as you like! Wash and chop your squash into 1″ cubes. 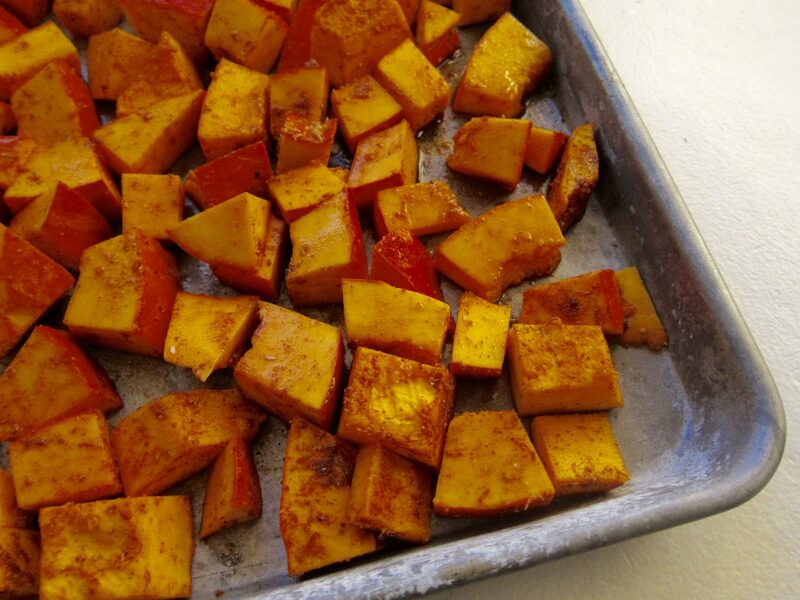 Place the squash cubes in a bowl and toss them with the olive oil, spices, salt, and pepper. Spread the squash evenly on a rimmed cookie sheet or roasting pan and roast, uncovered, until the skin is easily pierced with a fork, about 30 to 40 minutes. 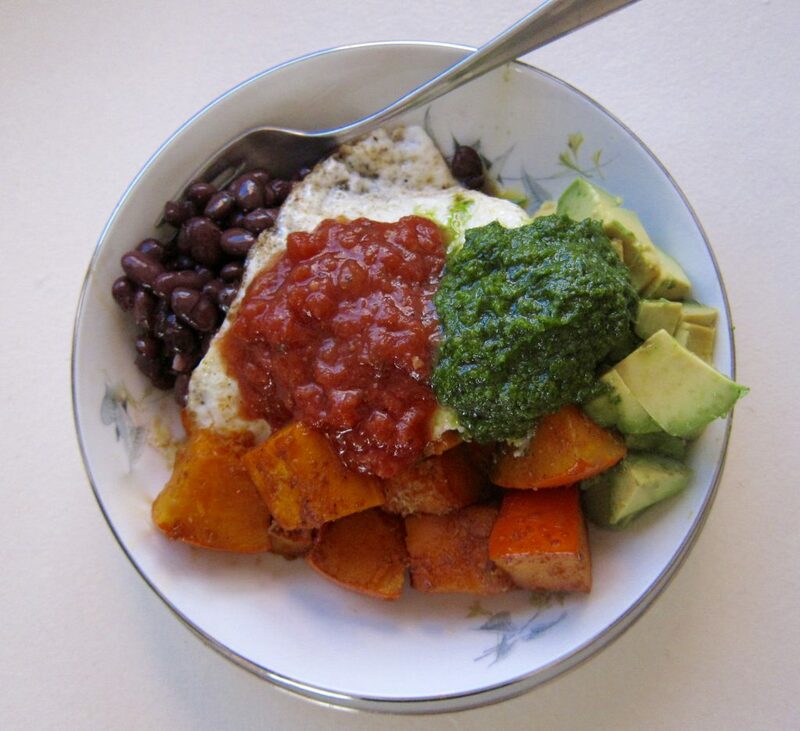 Place the squash in a bowl and top with your beans, avocado, salsa, and cilantro pesto. Optionally you can add a friend egg on the top for breakfast!